Over-the-top video revenues in the Middle East and North Africa (MENA) are set to more than quadruple between 2016 and 2022, according to new research. 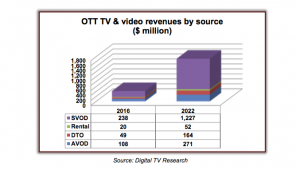 Digital TV Research predicts that OTT TV episodes and movies will generate revenues of US$1.75 billion by 2022, up from US$428 million in 2016, as subscription video-on-demand’s dominance over the sector grows. 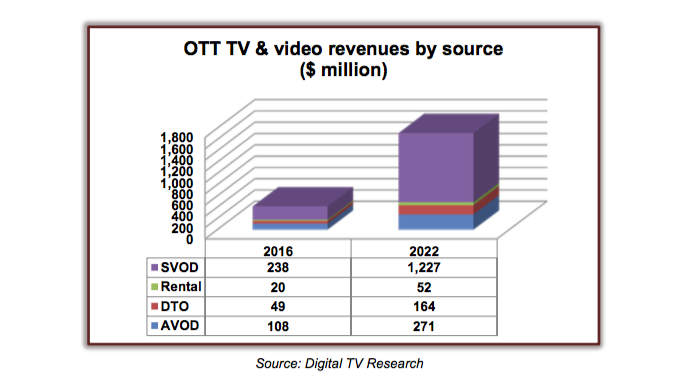 “SVOD revenues will reach US$1.23 billion by 2022 (or 70% of the OTT total); nearly US$1 billion more than the 2016 total (56% of OTT revenues),” according to the MENA OTT TV and Video Forecasts report. Digital TV Reasearch predicts there will be 17.27 million SVOD homes in the region by 2022, up from 3.74 million at the end of 2016, with Turkey to remain the leading market “by some distance”. Netflix, Amazon Prime Video, Icflix, Starz Play, Iflix and Shahid Plus are expected to account for 39% of the region’s SVOD subscribers by the end of 2022, up from 34% in 2016. However, excluding Israel and Turkey, these top six regional platforms are tipped to account for 78% of SVOD subscribers by 2022 – down from 88% in 2016. Netflix is expected to be largest pan-regional SVOD platform in MENA by 2022, with an expected 3.26 million paying subscribers. The research meanwhile predicts that Icflix will cross two million subscribers by 2022 and that Starz Play will add a further 1.60 million. “A handful of mobile operators such as Orange, Zain, Ooredoo, Etisalat and Vodafone have assets across several countries,” said Digital TV Research principal analyst, Simon Murray.